After being confused for decades, President Trump has officially changed Link's name to Zelda in the popular video game series The Legend of Zelda. WASHINGTON, DC – President Donald Trump signed an executive order this week renaming the central character in The Legends of Zelda video game. 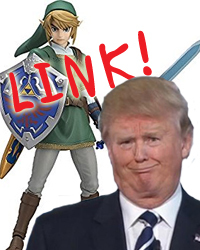 In the popular The Legends of Zelda video game series the central character’s name is Link, not Zelda, a fact that has caused confusion in Trump for nearly 30 years. Through the executive order, Link’s name will be changed to Zelda. Shigeru Miyamoto, one of the creators of The Legends of Zelda games, says he will sue to maintain the Link’s name. The executive order has received positive support from many republicans, as expected. The name change is scheduled to take effect immediately. Trump has promised to make other, similar executive orders including renaming Mario to Donkey Kong and renaming Pac-Man to Ms. Pac-Man.